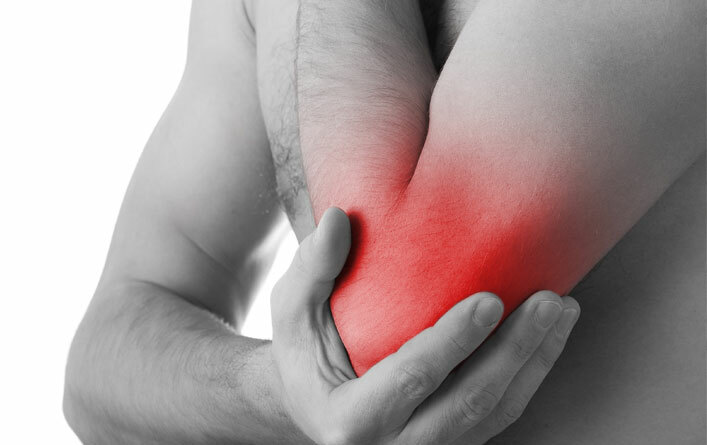 Tendinitis or tendonitis refers to a condition where the tendons (tissues connecting muscles to bones) become inflamed due to some reasons. It can occur almost anywhere in the body, but most commonly affects areas surrounding joints of movement, such as knees, shoulders, elbows, wrists, and heels. Depending upon the region involved and the character of the injury, there may be several varieties of tendinitis. Medically termed as lateral epicondylitis, tennis elbow is a common condition occurring mainly due to overuse of arm, forearm and hand muscles. Abrupt injuries affecting muscles and tendons of the area around the outside of the elbow, as seen in cricketers and tennis players, result in pain and gradual development of this condition. It commonly affects individuals in the 30-50 age groups and is more common in males than in females. Typically, tennis elbow involves the dominant arm in individuals. Carpenters, mechanics, office-cleaners and gardeners are especially susceptible to injuries due to repetitive arm movements while tightly gripping something. Patients complain of experiencing sharp pain while doing forearm activities like turning a wrench or swinging a racquet. The grip slowly becomes weak if the condition is ignored for long, and over the course of months, you may lose some strength on the affected limb. What to do if pain persists? If non-surgical treatments fail to improve symptoms after 6-12 months of therapy, surgery is recommended. Each patient has different requirements; so you must talk to your doctor regarding the best way to approach the treatment in your case. Both open and arthroscopic surgeries are helpful, followed by a period of rehabilitation to get you back to your normal life. Live a healthy, prosperous life. Choose Physician Partners of America for all your healthcare needs.